A viewer's comment posted during Mondays with Myrt needs to be clarified. Cousin Russ researched the claim and reports "An update on the Chromebook question about installing programs: That information mentioned is incorrect. No PROGRAMS will be able to be installed on a Chromebook . What WILL happen later this year for the Chromebook, is that APPS will be available in Google Play as well as the Chrome Store. So it's a different place to get apps." Thank-you Russ. There is a difference between buying say a genealogy software PROGRAM and using an APP. We will add information as this Chromebook option becomes available. 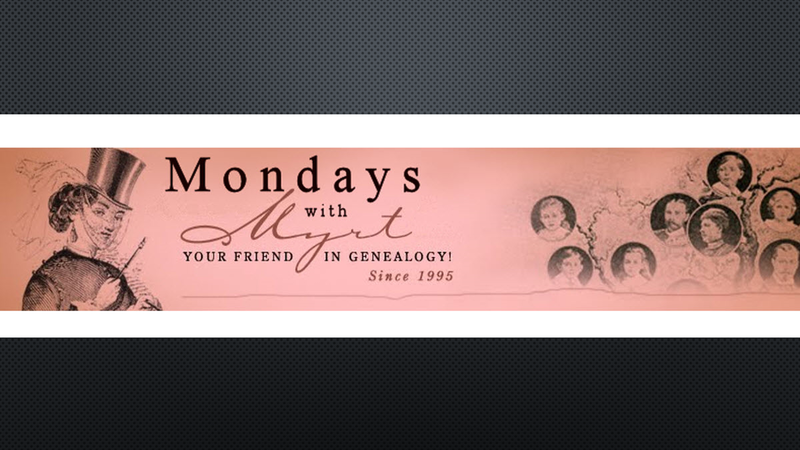 As always we try to provide the most accurate info about what's trending in the world of genealogy and technology as it applies to our family history research and sharing. Marcia Philbrick suggested presenters consider "QR codes would be a good addition to the audience participation. There are free sites to generate the code and it can be put on the slide. Participants can use a QR reader to 'scan' the code and open the site." Audrey Martin reports "The Indiana Death Certificates [at Ancestry.com] have already taken a few bricks out of a brickwall that has been plaguing me since I first started research my husband's Martin family about 10 years ago. I was able to go back one generation on this line and two generations back on his wife's line. We traveled to the local library on a whim on Saturday and found even more information." Kathleen Moore explains she "had some problems with the Index in the new Indiana records but I was able to find what I needed because I knew the year to look at." In our discussion about flying kites, Sue Adams recalls "Flying kites just triggered a memory. My dad organised a kite competition for the scouts. On the day it blew a gale, blowing away the homemade kites!" The adventuresome Molly McKinley recalls "We used to climb on Pop's grape vines and walk across the metal frame...never realizing how dangerous it was." Betty-Lu Burton says "I remember my grandpa Johnny's automated piggy banks. We loved watching the monkey or whatever grab the penny." Tami Crandall recalls "Summer pot luck BBQs on Sunday." Hillary Gadsby remembers "We had the leftovers of the weekend roast with homemade chips on Mondays." Anna Koeneke says "Whenever I would go to my grandma's house she would always make a lot of pies. One time there were 5 of us visiting and six whole pies to eat." Audrey Martin remembers "Having my great-grandma's Baked Cinnamon Apple Cake. That was until the one year when her dementia got the best of her and she forget the sugar and put in double flour. And going shopping with here on Saturday mornings and she would always get Momma Rosa Pepperoni Pizza's and Homemade Oreo Ice Cream." Cheri Hudson Passey explains "My Grandmother would take a nap every afternoon. She would say "I'm not sleeping, I'm checking my eyelids for holes". I think of that often when I lay down to take a nap!" FALL 2016: WHAT TOPICS MIGHT WE DISCUSS? Ol' Myrt here sent out a request for comments from the hangout viewers about the topics they'd like to see discussed in study group sessions this fall. Valerie Eichler Lair suggests the Board for Certification of Genealogists' Genealogy Standards Manual, 50th Anniversary Edition. We are open to additional suggestions before we make our final decisions.